Economists with the Food and Agricultural Policy Research Institute (FAPRI) and the MU Agricultural Markets and Policy (AMAP) team release the annual U.S. Baseline Outlook report each spring. The baseline projections for agricultural and biofuel markets were prepared using market information available in February. Pressure on farm finances appears likely to continue according to the latest analysis of national and global agricultural trends from the University of Missouri. While the analysis shows a projected net farm income increase in 2019, farm income remains below the average of 2014-17. Longer-term projections suggest little change in real net farm income over the next decade, resulting in continued increases in the farm sector’s debt-to-asset ratio. FAPRI’s analysis shows that projected prices for U.S. soybeans and other products affected by current trade disputes remain below levels that would prevail if foreign tariffs were removed. The projected average 2019-20 prices of soybean, corn and wheat do show slight increases from 2018-19, with soybeans at $8.78 per bushel, corn at $3.81 per bushel and wheat at $5.31 per bushel. Further recovery in wheat prices could be limited by continued large global supplies, while cotton prices could fall in 2019-20 in response to increased U.S. production. Westhoff added that part of the reason crop prices are lower is due to recent growing conditions. He said the past six years have featured relatively solid growing conditions worldwide, leading to large crop supplies. Increasing U.S. meat supplies continue to weigh on livestock and poultry prices in 2019. The possible impacts of African swine fever in China and other countries have pushed up pork futures prices since the estimates were prepared. Under the 2018 Farm Bill, more corn, soybean and wheat producers are projected to choose the price loss coverage (PLC) program when they have a chance to make new program elections in 2019. Projected PLC payments total an average of $5 billion per year over the next decade, with other commodity programs adding another $1 billion per year in payments. Although it remains well below the levels of the 1980s, the ratio of U.S. farm debts to assets has increased from 11.3 percent in 2012 to 13.5 percent in 2018. The outlook is for continued stress on farm finances, with the debt-to-asset ratio averaging 14.8 percent between 2020 and 2028. The U.S. Baseline Outlook is prepared annually by economists with FAPRI and AMAP and is updated each August. 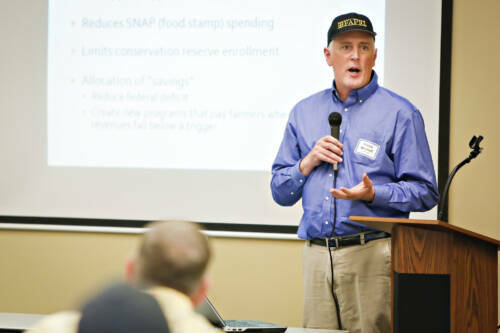 Westhoff said the report gives policymakers, farmers, agribusinesses and the public an overview of the state of the U.S. farm economy. The market projections it contains can be useful to farmers making production choices, to policymakers trying to decide how to respond to agriculture issues, to lenders who must decide whether to make loans and to agribusinesses making investment decisions. The sixth annual Abner Womack Missouri Agriculture Outlook Conference will dive deeper into the U.S. Baseline Briefing Book with presentations from FAPRI analysts and outside guests. Registration for the conference, which will be held from 10 a.m. to 3 p.m. on Wednesday, April 17, at the Bradford Research Center (4968 Rangeline Road) in Columbia, is currently open. The conference is free to attend, but registration is required to reserve lunch. The conference is funded through the Womack Fund for Excellence in Agricultural Policy. The full U.S. Baseline Outlook will be available today at noon CST on FAPRI’s website.